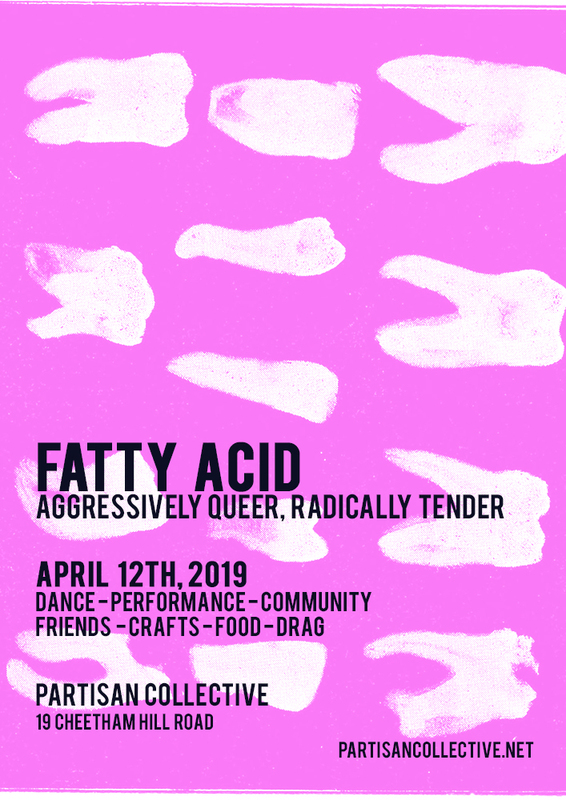 For trans and queer folks, and their friends, FATTY ACID is Partisan’s LGBTQIA+ night! The first time was a blast so obviously were gonna do it again! Save the date! We’ll be filling you in with all the fun details soon. WOULD YOU LIKE TO PERFORM? Email vicky@partisancollective.net and tell us all about yourself. £10 – Solidarity ticket. If you can afford to, buy this ticket to support our fund of free tickets to those who need it, and our taxi fund for trans women of colour. Free ticket – we have a limited amount of free tickets for those who need them. These are for LGBTQIA+ people – especially those who are trans, people of colour, disabled, or unemployed. This is based on trust, so if you can afford to pay, please buy a ticket. Free ticket for a PA – if you are a disabled person who would benefit from the company of a personal assistant, please add this along with your full priced ticket so you may have a person to accompany you. We are not yet wheelchair accessible, see full accessibility information here. Tickets will go off-sale at 6pm on the evening of the event. Partisan Collective is a volunteer run arts and community centre, so this event is being organised by volunteers, with all profits from the evening going back to support us giving space to good causes and DIY cultural activity. If you’d like to help out with organising and running Fatty Acid, come along to our next meeting! Check our website and facebook events for the next meeting.